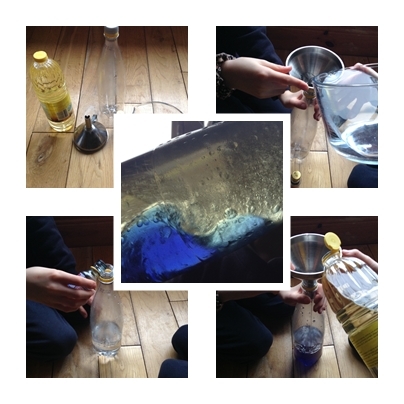 These two experiments are inspired by Dr. Simples latest post about “Why the sea is salty“. Take the floating egg experiment one step further! Take this one step further…. We mentioned in the video that you can take this experiment a step further. Float the egg in the salty water as before. Add a few drops of food colouring to a jug of unsalted water. 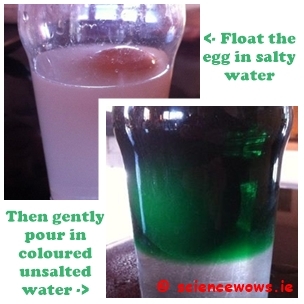 Carefully pour this coloured water down the side of the glass so that it sits on top of the salty water. The egg will sit between the two layers… can you see it in this picture? This is a really simple experiment but always keeps both young and old entertained!